Architectural Style: Between 1920 and 1930 J.A. 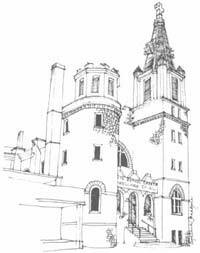 Lankford, a black architect, changed the identity of the restored church from Victorian to Romanesque Revival. 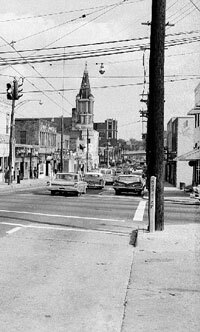 Original Use: Has been an important spiritual/social/political institution in the Sweet Auburn Ave. Community since inception. Present use: Continues functioning as a community church. 1879- the Gate City Colored School, the first public school for African Americans in the city is founded in the basement of Big Bethel. 1881- Morris Brown University is founded in the Basement of Big Bethal A.M.E. Church. Mary McCree is the first principle. Bishop Wesley J. Gains contracts with Armstrong soap for the school to receive a percentage of all proceeds from soap sold in a certain period. From this percentage the university's first building is erected in 1885. 1922- A lighted cross and neon lights bearing the words "Jesus Saves" are placed on the steeple of the Big Bethal A.M.E. church. 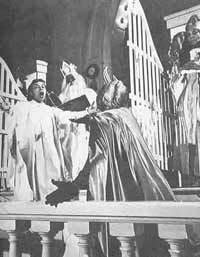 1930- The notable morality play "Heaven-Bound" was first performed and has since been shown many times to national acclaim. 1936- Feb.12; John Wesley Dobbs speaks for 2 hours at Big Bethal to awaken the political conscience of Atlanta's 90,000 blacks. He proposes that night to organize the Atlanta Civic and Political League to register 10,000 voters. Twenty-eight year old C.A. Scott, owner and editor of The Daily World backs him up the next day in his newspaper. 1937- The Federal Theatre of the Works Progress Administration sponsors a production of "Heaven-Bound" in the Atlanta Theatre. Founded in 1847, Big Bethel is the oldest predominately African American congregation in the metropolitan Atlanta, Georgia area. At the time of the founding Atlanta was still called Marthasville. After the Civil War the congregation became associated with the African Methodist Episcopal Church, the first independent denomination in the country. Bishop Payne sent Reverend James Lynch to organize the AME Church throughout the South. While passing through Atlanta he met Brother Joseph Woods, a member of Bethel Tabernacle. A year later in 1865, Reverend Joseph Woods was appointed as the first pastor of Big Bethel A.M.E. Church. Big Bethel rapidly grew to become a center of the community as well as a focal point for social action. In 1879, the Gate City Colored School, the first public school for African Americans in the city, was founded in the basement of Big Bethel. Later, the school moved to a basement on Houston Street. In 1881, Morris Brown College, the only college in Georgia started solely by African Americans, held classes in the basement of Big Bethel before moving to its first campus. 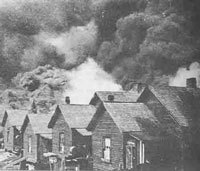 In 1917, fire struck the area known as the Fourth Ward, destroying most of the area east of Boulevard, extending to Ponce. Big Bethel was the only church in the ward owned by Blacks and still standing. As a result the church served as a hub for the gathering of large numbers of African Americans for public meetings between 1917 and 1920. In 1920 fire struck the sanctuary and completely gutted it. The insurance policy on the church had expired the day before and a tremendous debt was incurred to pay for the rebuilding. Between 1920 and 1930 J.A. Lankford, a black architect, changed the identity of the restored church from Victorian to Romanesque Revival. Crowning the newly rebuilt Big Bethel was a lighted cross bearing the message "Jesus Saves" on the steeple. During this time an $8,500 pipe organ was installed. In 1930, Heaven Bound, morality pageant that gained world acclaim, was first produced as a fundraiser. The theme centered on faith of 24 pilgrims trying to reach the Heavenly Gates. In 1944, the Wedding of roses, a friendly competition between church auxiliaries, boards, and clubs was introduced by sister Ada Thomas to help pay off the debt from the 1920 fire. The activist movement of the 1960's left a distinct impression on Big Bethel. A new Black theology was flowering, and a more activist, liberation-focused church was evolving. Under the leadership of Pastor James Davis, Big Bethel has just completed a $1.8 million dollar renovation. The church is now accessible to the physically disabled and is home to a deaf signing ministry.